The preferred choice for chefs worldwide, our smoked sea salts are delicious, balanced, and packed with deep smoky flavor. 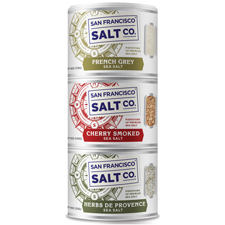 Smoked salts have been a culinary favorite of chefs and food-lovers for centuries; now, the San Francisco Salt Company brings the magic to you! 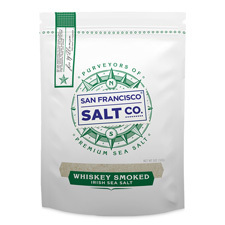 Our smoked sea salts are made by smoking only the highest quality Pacific Sea Salt over real wood-burning fires, resulting in rich, hearty, smoky flavors that complete any dish! 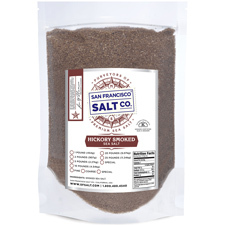 THE PERFECT ADDITION TO ANY MEAL - Smoked sea salts are a timeless favorite that add unparalleled flavor and dimension to any dish. 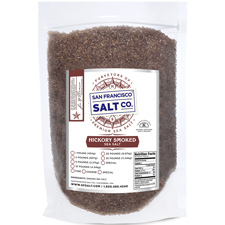 Whether you are cooking a quick meal for your family, looking to spruce up a snack, or going all-out with a gourmet feast, smoked sea salts are the perfect finishing touch! BENEFITS OF SMOKED SEA SALT - Unlike ordinary table salt, which is often processed and refined in a way that removes most minerals, our sea salt is harvested and sold in its natural state. Natural sea salt is not as refined as other types of salt and contains a variety of trace minerals that are essential for our health. 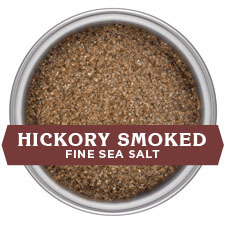 SMOKED HICKORYWOOD - Smoked Hickory Sea Salt is made with pure sea salt that has been slowly smoked above a Hickorywood fire. Enjoy RICH, AROMATIC Hickory flavor with this essential smoked salt. Flavor Profile - Hickory is an iconic BBQ flavor that adds an aromatic intensely smoky bacon flavor to any food that it garnishes. Pairs Well With - Red Meat, Pork, Ribs, Wild Game, and Homemade Sweet Hickory BBQ Sauce. 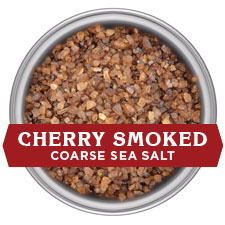 SMOKED CHERRYWOOD - Made with pure Sea Salt that has been slowly smoked above a Maine Cherrywood fire in a centuries old process. The result is a mild FRUITY, SMOKY tasting sea salt, without harshness or bitterness. 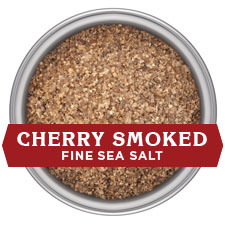 Flavor Profile - Cherrywood Smoked Salt is an incredibly versatile sweet, smoky delight that is sure to add a very mild smoky fruit flavor to any meal. Pairs Well With - Red Meat, Pork, Beef, Ribs, and Homemade Smoky Caramels. SMOKED APPLEWOOD - This natural, light SMOKY-SWEET flavor is created by slowly smoking pure sea salt above an Applewood fire in a centuries old process. This salt’s light texture makes it a wonderful finishing salt, great for seasoning a variety of dishes. Flavor Profile - Our Applewood Smoked Salt instantly adds authentic flame cooked flavor to food in the comfort of your own home! 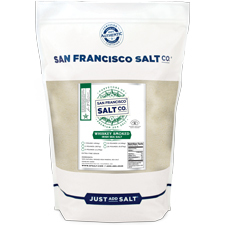 This salt is very light, lightly fruity, and aromatic without overpowering the taste buds. Pairs Well With - Poultry, Chicken, Pork, Big Game Birds, and Grilled Fruits. SMOKED ALDERWOOD - Created with pure Pacific Sea Salt that has been slowly smoked above a Northwest Red Alderwood fire. 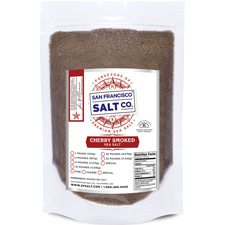 This is an extraordinary MUSKY, RICH-TASTING sea salt without harshness or bitterness. Flavor Profile - Alderwood Smoked Salt is an unbelievably smoky salt that smells as rich and delicious as it tastes. 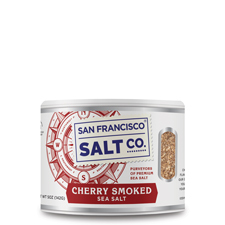 This salt instantly adds campfire flavor to any meal! Pairs Well With - Smoked Salmon, Fish, Poultry, Soups, Salads, and Vanilla Ice Cream. 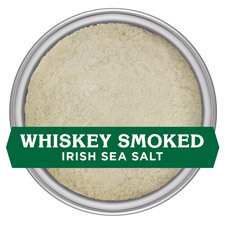 WHISKEY IRISH SMOKED - Whiskey Smoked Irish Salt is created by smoking Oriel Irish Sea Salt above 90-year-old Nicaraguan oak kegs that held Teeling's finest Irish whiskey during its last 10 years of aging. The smoking takes place just hours after the kegs are emptied so that the salt develops the richest possible whiskey and oak aroma and flavor. Flavor Profile - Our Whiskey Irish Salt combines three incredibly SMOOTH and POWERFUL flavors: Irish Whiskey, Smoked Oak, and Irish Sea Salt. This unique smoky salt is a must have for amateur chef’s and seasoned smokers alike! Pairs Well With - Red Meat, Poultry, Fish, and Potatoes. 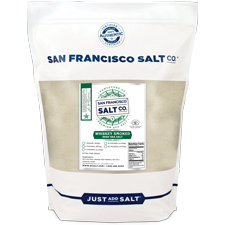 *These salts do not supply iodide, a necessary nutrient. BBQ/Grilling: Unsurprisingly, smoked sea salt goes great on anything barbequed – ribs, chicken, hamburgers, skewers, grilled veggies, and fish all benefit from a sprinkle of smoked salt. 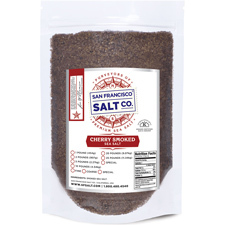 In Lieu of Grilling: These smoked salts add authentic char broiled flavor to food when you are unable to or simply not interested in grilling. 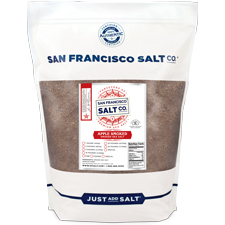 Brines: Soak chicken, turkey, and fish in smoked salt brines to tenderize meat while adding multidimensional rich, smoky flavor! Oven-Broiled Meats: Sprinkle meat with a touch of one of our smoked sea salts before broiling so that the smoky flavor can truly permeate the meat. Your steak will be so flavorful that no sauce will be needed! Smoked Salmon: Add Alder Salt to salmon before baking to give it an authentic smoked taste! 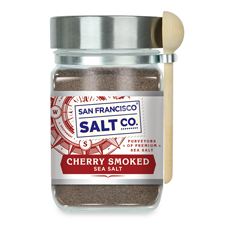 Alcohol Enhancer: Smoked Salt adds a deeper layer of flavor when used in Bloody Mary recipes. These salts also shine when used around the rim of your favorite ale or cocktail. Vegan Collard Greens: Use Applewood Smoked Sea Salt to replicate the smoky bacon flavor of collard greens, without any meat! 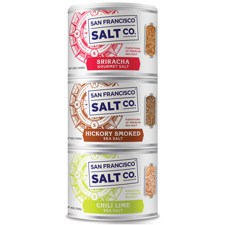 Bring Authentic Smoky Flavor to Vegan/Vegetarian Dishes: Try our smoked salts in vegan or vegetarian versions of meat based recipes to replicate that fresh off the grill flavor- after eating smoky tofu, smoked tempeh, smoky seitan, and smoky jackfruit, you will never go back! Stir-fried Vegetables: Stir-fry your favorite veggies in olive or canola oil and finish with a dash of smoked salt. Corn on the Cob: Spice up your corn on the cob with a touch of butter and a light dusting of fine-grain smoked sea salt. Kale Chips: Lightly brush olive oil on to homemade kale chips and dust with a sprinkle of smoked sea salt for a smoky finish. Popcorn: Use smoked sea salt instead of ordinary table salt to elevate your popcorn to another level. 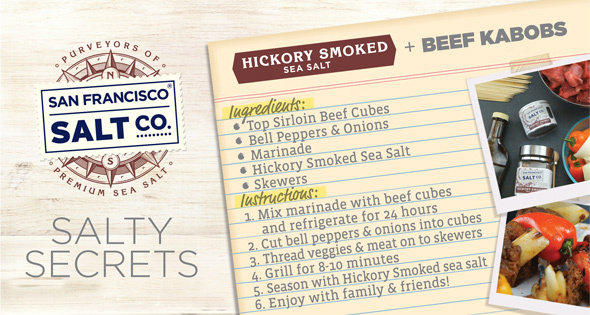 Smoked Salt Caramels: Replace standard table salt in your favorite caramel recipe with smoked sea salt for an unexpected flavor fusion. Ice Cream Enhancer: Sprinkle a light dusting of Alderwood Smoked Salt on top of Vanilla Bean Ice Cream to transform plain vanilla into a unique treat that mimics the taste of a root beer float!